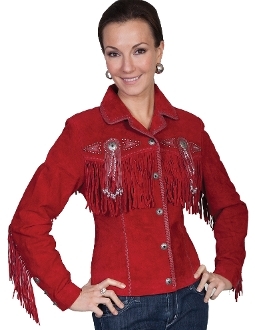 SCULLY WOMENS RED BOAR SUEDE (STRETCH SUEDE) Western jacket. SCULLY STRETCH Suede fringe western jacket. (1 side only) SEAM TO SEAM ONLY. or under pit to under pit. sleeve Length Top to bottom= 25"
sleeve Length Top to bottom= 25-1/4"